If this book were a piece of clothing, it would be a St. John suit: practical, professional and beautifully constructed. 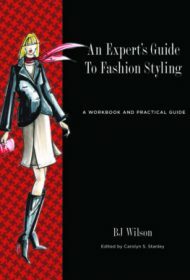 Designed as a workbook, An Expert’s Guide to Fashion Styling details the six-step wardrobe consulting process trademarked by the author, who has operated a wardrobe consulting company in Fort Worth, Texas since 1983. The well-organized workbook is arranged into three parts that are designed to show a would-be personal stylist or wardrobe consultant everything from how to organize a client’s closet to how to write a business plan. Sample chapters include tips on recognizing various fabrics, taking a client’s measurements, organizing a wardrobe by seasons and clothing categories, shopping for clothes, billing and marketing, setting up an office, and determining how to price various services. The professional and eye-catching graphics divide the chapters into easy-to-read sections, making it possible for readers to skip to topics they’re particularly interested in. Numerous illustrations and pages for note taking make the book both helpful and attractive. The only flaw is that the book is occasionally repetitive, especially in the action steps at the end of each chapter, which sometimes simply parrot the information discussed in the previous pages. But that’s a nitpick in an otherwise comprehensive and professionally written guidebook. Anyone who has ever considered becoming a fashion stylist or wardrobe consultant would be well advised to read this book. It also contains valuable information for those who would like to launch a business of any type, or simply revamp their closet and dress better.